THERE COMES a time in every collector’s life when he or she realizes that the road has suddenly ended—that there’s hardly anything more to be found, no further byway to be explored. It’s a sad acknowledgment but also in some ways a relief, knowing that one’s disposable income (and better yet, one’s savings) can go to more prosaic but in all likelihood more practical objects—a roof repair, or new tires for the car, or a larger fridge, all long overdue. None of those, of course, will quite compare with the gleam of a 1786 Carolus III dos reales or an early edition of the Noli or Fili, or a 1950s Mercedes 180 (nothing too special, just one of my favorites) tucked away in an old garage. 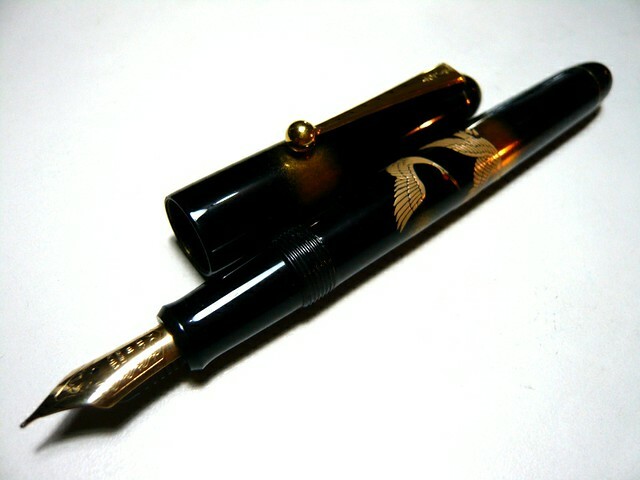 Or, in my case, a 1936 Wahl Eversharp Coronet, widely upheld to be the “acme of Art Deco pen design.” I’ve lusted after a Coronet in more than 30 years of pen collecting, even keeping a picture of it in my burned-out Faculty Center office, and maybe came close to acquiring it once. But like all “grail” pens, it remained a wisp of a dream, within tantalizing sight but always beyond one’s feeble grasp. I knew I’d come to the end of my collecting road when the thought struck me the other day that if a Coronet were to be offered to me tomorrow for a reasonable price, I would probably smile and politely decline, preferring to keep it a pretty phantom forever. If I actually held it in my hand it might seem dull and stale, its Pyralin inserts (whimsically described as “Dubonnet red”) somehow lacking in the fire of fantasy. Come to think of it, I’ve bought only two or three pens over the past three months—at least one of them for resale—when I used to acquire one almost every week. At its peak three or four years ago, my collection of vintage and modern pens numbered more than 300, ranging from the 1890s to the present and representing many of the best pens of every period (excepting the Coronet), by brand and model. It was a collection put together over many years of patient pursuit, of moving up from one model to the next tier, of selling five average pens to buy a first-rate one, of foregoing ampler lunches in my grad-school days in the American Midwest to be able to afford mid-range Parker Duofolds, Vacumatics, and 51s. Some of those early buys turned out to be bargains and lifetime keepers. Back in 1987, I agonized for a week over whether to purchase an ebony Wahl Eversharp Doric from 1934—another Art-Deco icon, with a 12-sided cap and barrel and a latticed cap band—for the princely sum of $28. Thankfully beauty won over economy and I still keep the Doric, now easily ten times its purchase price. Another classic I found at a Milwaukee antique shop in 1990 for a small fraction of its true value was a Parker Duofold Senior in Mandarin Yellow, a large fat pen from the mid-1920s, much sought after for the rarity of its color. Bought for $68, I had to resell it a year later for $380—still well below what it would fetch today—when I was living on turkey backs and trash fish on my meager stipend. 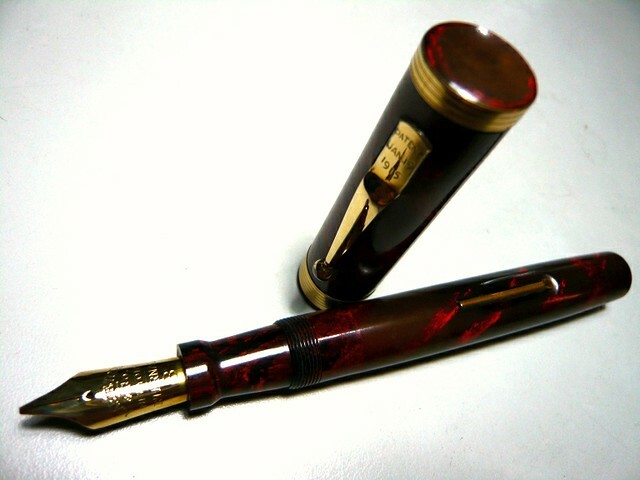 And how can I forget the gorgeous 1938 Parker Vacumatic Oversize in burgundy red which I found in Edinburgh in 1994 and based my “Penmanship” story on? It was stories like these that kept my interest in collecting alive, almost as much as the pens themselves, the remaining 150 or so of which I can’t possibly all use and learn to love, even if I rotated them every other day. I still value my best pens as marvels of both art and engineering, which also just happen to lay exquisitely shaded lines and whorls of glorious ink on fallow paper. I suppose the end began a couple of years ago, when I turned 60. 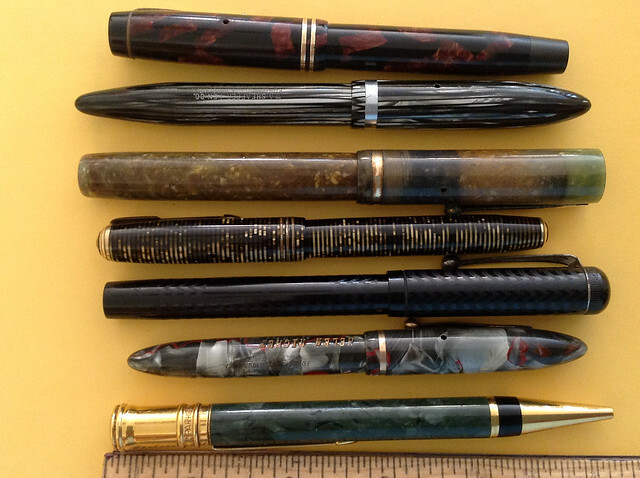 I started selling pens from my collection—even pens I had kept for over 25 years—to allow the members of our pen club, especially our millennial newbies, the privilege of owning and writing with something their grandparents may have used. 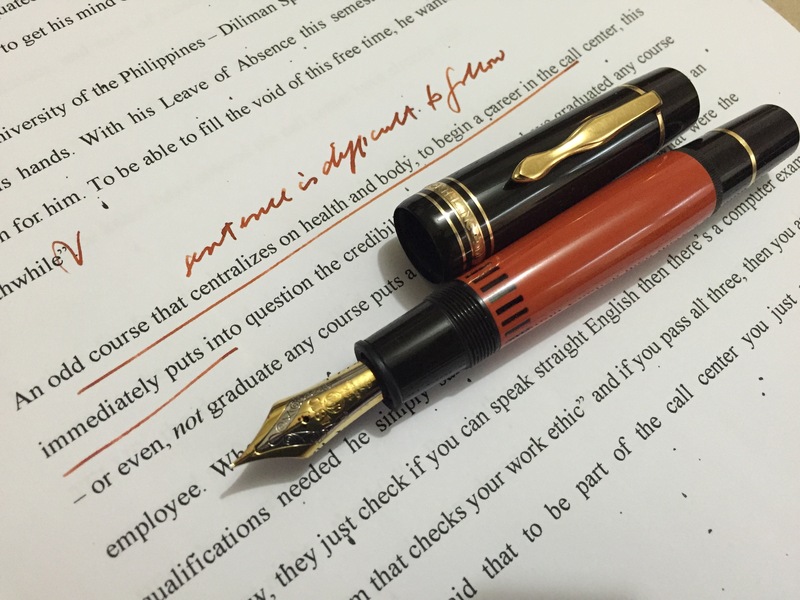 That’s also when I began using my best pens, like the Montblanc Agatha Christie, on a regular basis—a bit like driving a Rolls to the 7-11—but my reasoning was, as we UP people like to say, if not now, when? What might have been ostentation at age 35 can now only be fondness in a senior, and the silver-snake-clipped Agatha gives me sublime pleasure even in the pocket, and many times more so when I sign my name—even on office forms—with its double-broad stub nib and sepia ink. Such, I think, are the pleasures of aging, when one turns from sheer accumulation to discernment, and to the dawning acceptance of the finitude of all things, including and especially material objects, no matter how lovely and intricate and painstakingly acquired, be they pens, cars, watches, or Persian carpets. Whereas I used to check eBay literally a dozen times a day (employing a special search term to ferret out the most desirable vintage pens), today I hardly blink when, say, a 1928 Parker Big Red sails under my nose for less than $100—let someone enjoy the bargain, as I’ve done myself many times. It was the hunt that kept me in the game, but I’ve learned that spotting the target but letting someone else take the shot could be just as satisfying. In what was likely my last big pen adventure, a few months ago, I found another of my “grail” pens—the much-coveted Montblanc Ernest Hemingway from 1992—being sold online for about half its usual price (if you really want to know how much these babies cost, try Google). The seller was in Malaysia—reason, perhaps, for Western buyers suspicious of anything too far East to shy away, but to me a heaven-sent circumstance. Over the next few years, I’ll be trying to bring down my remaining stash to an absolute core of about two dozen pens, which will be our daughter Demi’s inheritance from me (sorry, anak, no tracts of sugarland or bubbleback Rolexes here). 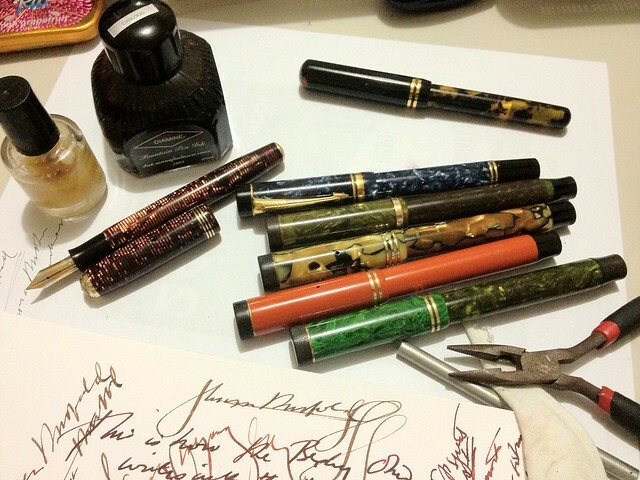 They won’t necessarily be the most expensive pens—Demi can sell those off, if I don’t—but the ones most laden with story, blobbing like ink at the very top of the nib, eager to be disgorged. It’s been a privilege playing steward to these fine shapers of fine words, and I may miss the chase but not yet the company. IT BEING a rainy Sunday here in Manila, I thought I’d take out some of my fountain pens—vintage and modern—for some routine maintenance (read: boy plays with toys). 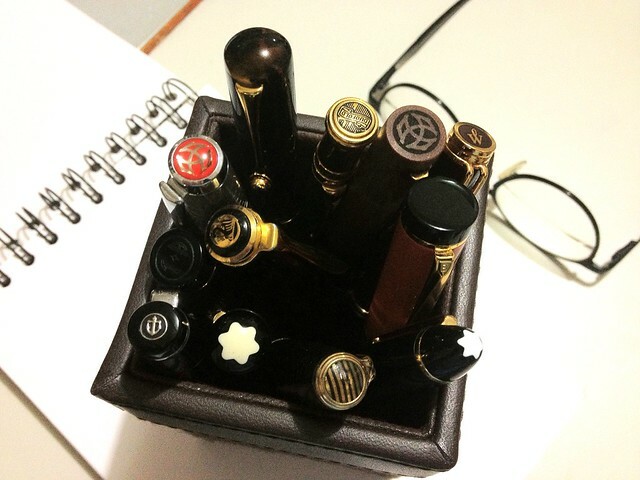 I took this shot of the pens with my iPhone, and I rather like its antique-y look. And while we’re at it, here are the pens in my current rotation. Can you identify them? FOR PHILIPPINE Star readers who may not know me from my earlier incarnations (no offense meant to the Gautama; the only thing Buddha-like about this Butch is his midsection) and who may be wondering about the column title, “Penman” refers both to a story I wrote a few years ago, “Penmanship,” and to my long and abiding fascination with old fountain pens, about a hundred of which I’ve collected over the past 15 years. Most of these beauties from the 1920s up to the 1940s came from antique fairs and garage sales in the American Midwest, where I lived for a few years, and from more exotic nooks and crannies such as a backstreet pen shop in Edinburgh and a sidewalk vendor in Saigon. Some I’ve received as generous gifts from friends (a clutch of Parkers and Sheaffers from Franz Arcellana—pens he actually wrote his stories with—and a breathtaking Japanese maki-e lacquered pen from poet Jimmy Abad). Now and then—say, after a few months without adding a new-old pen to the trove—I satisfy my urges by getting one on the Internet or, less often, by taking a deep breath and paying full price at the local mall (although I once found a very nice pair of new Parker Duofolds selling at practically half-price in a department store in Cebu). Still even more rarely, I’ve come across some astounding bargains in my own backyard—an antique stall in Ermita (a Montblanc 146 and a much-sought-after 1959 Sheaffer PFM V for P650 each), and a stationery shop in Binondo (a rather uncommon Parker VP for P350). Never mind what these names mean, if you know or care nothing about pens: just think of them as exquisitely lovely, useful, and—to some people who collect them for more than aesthetic reasons—quite valuable objects, some which have sold at auction for over $10,000 (no, that’s not your grandfather’s Wearever or Esterbrook, for which you’d be lucky to get enough for a movie and a hotdog sandwich). I have an awful suspicion that most of the good pens we must have once had in this country—any colony with a highly-literate bureaucracy should have been swimming in a sea of blue-black ink—would have long had their gold nibs pulled and melted down in the smithies of Meycauayan to make someone a pretty trinket or a gleaming incisor. The man behind the counter consulted a woman who was doing the books. “Five hundred,” she said casually. I felt faint: P500 for a fancy Bic may be outrageous to you, but if they had ten of these and I had P5,000 on me I would have bought them up and retired on the profits. The pricing also told me that the sellers had probably found the pen among other effects in a large estate (you had to be very rich to own an accessory like this in the late ’20s) and had, themselves, paid very little if anything for it; many old pens come as bonuses to buyers of many-drawered antique cabinets, or even of cigar boxes, where they tended to be kept and forgotten. “Oh, that’s all right,” I managed to say, taking full and final possession of the Swan and sticking it into my pocket, where I was certain that God Almighty had always intended it to belong. Surely, there was more than a touch of justice here. How many times, during my months in England, had I revisited and salivated over the fabulous pens on Portobello Road, going home to Norwich with little more than a jar of bagoong and a packet of Chippy from the Filipino food store at Earls Court? Just how many of the half-dozen Pinoys who can tell a Swan Eternal from a Rubber Ducky stumble into one, in a mall buzzing with Nokia ringtones, and get to bring it home for the price of a phone card? I treated Beng out to a lunch of noodles and siopao and proudly showed her my prize find. She herself prefers to pick up old blue and ruby-red bottles, but has developed a grudging respect for and even some expertise in my objects of choice—once spotting, at a cowshed fair in Ohio, a circa-1930 lapis-blue Parker Duofold Junior which I bought for $5 and later traded for my first Montblanc. “It’s gorgeous,” she agreed, “but you should have asked for a discount.” Spoken, I suppose, like a true shopper. But this wasn’t shopping, Beng. This was serendipity, for which I can only thank my lucky stars and, yes, you, for dragging me out of my Sunday-morning stupor to find kitchenware for newlyweds.